Vladimir Putin has threatened me, my family, my nation and the world with nuclear annihilation, so I must confess to being a tad bit biased against him. He was a KGB operative for many years and a close friend of Stasi agent Angela Merkel, now Chancellor of Germany. I do not like what these communists are doing to Europe and the rest of Western Civilization. I freely admit that, because I believe Putin is setting us up for a Third World War. Let's have a look at the dots. . . .
• Communist Barack Obama has gutted our American military. He appointed career Russian apologist Chuck Hagel as Secretary of Defense, where "Global Zero" Hagel set about undermining our military forces, especially our nuclear defenses. Obama appointed communist Hillary Clinton as Secretary of State, then replaced her with crypto-Jew John Kerry (Kohn). Obama watched largely in silence as Putin invaded the Crimea and stole it from the Ukraine. Obama gave Russia vital territory and allows Putin to take over the arctic, the window through which ICBMs can attack us. • Before Jens Stoltenberg became Secretary General of NATO, he was a communist terrorist and KGB agent "Steklov". The KGB/FSB is in complete control of NATO's topmost post, as well as the German government, which is a highly dangerous state of affairs. • Putin is funding anti-NATO political parties and candidates in Europe, so as to turn NATO countries against themselves and one another. Putin's pet political philosopher, antiwestern fanatic Alexander Dugin, wants Russia to convert all of Europe into bolshevik vassal states to serve as a buffer for the reborn Soviet Union (and communist China). When Putin's ISIS terrorists attacked in Paris, Putin was the sole beneficiary. The KGB's false flag attack on Paris bolstered Putin's favorites, the Le Pens, in the polls just prior to an election, and Putin made himself out to be a hero for fighting his false opposition of ISIS in Syria. It is interesting to take note of Marine Le Pen's Jewish boyfriend Louis Aliot, and Marion Maréchal-Le Pen's biological father, Mossad agent Roger Henri Auque. 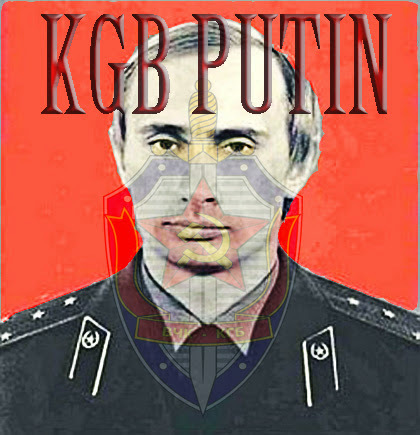 Auque's mother, like Putin, was a communist. • Putin wants Greece and Turkey at one another's throats so as to drive a deep wedge into NATO and takeover the Bosporus and Dardanelles shipping lanes into the Mediterranean Sea. He has already flanked NATO nation Turkey in the Crimea, and is about to flank Turkey on the opposing front in Syria. Israel sits in silence as Russia establishes itself on Israel's border, because Russia ultimately takes its orders from Israel, as does ISIS. It is interesting to take note of the fact that both Syriza and the Golden Dawn of Greece are anti-NATO and support Putin. It is also interesting to take note of the relationship between Putin's bolshevist political advisor Alexander Dugin and alleged Ergenekon member and marxist chieftain in Turkey Dogu Perincek. • Putin has reconstituted the Soviet Union in the form of the Eurasian Economic Union, which is swallowing up nations that form a corridor through which communist China can attack Europe. Red China wants to devour Greece and the rest of Europe. Putin is an Asian supremacist communist who wants Europe dead. The KGB long ago infiltrated the Russian Orthodox Church and has made it antiwestern, together with all the other traditionally European-centric Russian institutions. • Putin is attempting to cut Europe off from Middle Eastern oil and natural gas reserves, while concurrently attempting to gouge Europe for the cost of Russian energy. He is helping Israel to level Syria and has communists in Turkey destabilizing that nation and communist agents in the European press and governments driving a wedge in NATO by condemning Turkey for defending itself from Russian aggression and the Russian encirclement of Turkey taking place today. Again, it is wise to take into consideration the friendship of Alexander Dugin and Dogu Perincek. Just as the jewish controlled press hid Stalin's atrocities while they occurred, they are covering up for Putin today. When we connect these dots, we draw a map of the communist conquest of Europe. The communists have greatly weakened Europe with a massive invasion of Muslims enabled by the neoconservertive Trotskyites and their permanent war on Muslim nations. Europe is now ripe for a full scale invasion from Russia and China due to the instability the heterogenous communist terrorism and invasion of foreign elements inspires. Internationalism destroys sovereignty and the loss of sovereignty heralds the loss of a national defense and military alliances. Putin will try his best to break apart NATO from within and without. He is paying traitors in America to speak out against America and Europe on Russian media and is making it chic for the libertarian crypto-communists here to turn Americans and Europeans against themselves in favor of Russian and Chinese communist interests. This is part of a long standing KGB war of demoralization on the West. Our dissidents pretend to be fighting the "Zionist West" in the old dialectic Churchill dubbed the war between Zionists and Bolshevists. In that struggle, Western Civilization ultimately loses and the communists are turning us against ourselves. Far from being an anti-Zionist, Putin richly rewards the Jewish oligarchs of Russia, maintains first rate relations with Israel, and welcomes in the Jews of Europe into Russia by pleading with them to return to the bolshevik paradise of the Soviet Union he is rebuilding. The wars and the bodies are piling up under and around Putin. He has his Chechen shock troops leading his false opposition front ISIS, which gave Putin a pretext to invade Syria and surround Turkey and NATO in his quest to become the oil and natural gas king of the world. Yet our dissidents react as if it were Turkey that was surrounding Russia, and our own people clamor for the demise of NATO, which is the only alliance standing between us and Putin's nuclear warheads! As communists always do, they have our dissidents degrading America and Europe and singing the praises of our communist enemy Putin. Putin is the new Che Guevara for our intellectual class, stylish and chic, poster boy butcher that he is. Yes, the money is flowing to our traitors to betray us to the communists. And they hate us as much as he does. Their hatred of their people, our people, spills off their tongues and issues forth from the safety of their keyboards and First Amendment rights acknowledged by the same US Constitution they seek to destroy. The Jews have used Turkey and Russia to provoke war time and again, under no lesser figures than Disraeli and Rothschild. History bears witness to the many Russo-Turkish wars that have spilled mankind's blood across the centuries, no fewer than 12 such horrors, more than my two hands can bear on their ten fingers, which I point now at Putin the war monger, in this accusation. And Putin has a partner and ally in instigating the revival of this historic mayhem. I speak of Turkish President and Israeli puppet Recep Tayyip Erdogan, who is the controlled opposition of Turkey's ruling secret society of crypto-Jewish freemasons. I refer to the Ergenekon, who govern Turkey on behalf of Israel from behind the scenes. Erdogan rose to prominence in order to take the place of Ahmadinejad as the apparent head of the Muslim opposition to Israel. Erdogan sent Kurdish Mossad to Israel on the Mavi Marmara, where the Israeli military immediately executed them for the benefit of the eyes of the Muslim world. That gave Erdogan street credit during the "Arab Spring" which soon followed, and which deliberately sent a wave of Muslim invaders into Europe by design, and straight through Turkey, among other routes. Today, Russia and Turkey are staging escalating incidents precipitating another world war. The communists thrive on permanent war, which weakens societies leaving them ripe for communist takeover through their permanent revolution. The communists then propose internationalism as the only solution to the war they forever foment, and having achieved it, provoke terrorism to keep themselves in power. Russia has taken over the Crimea and oppressed the Tartar population. That is a direct threat to Turkey and its interests as a NATO nation and a nation with long borders on the Black Sea and a long history with the Crimea. Russia has invaded Turkish airspace with military aircraft and flown countless bombing runs on Turkey's borders. Imagine Putin's response if Turkey had done the same to Russia when it invaded the Ukraine. I don't understand how anyone can fail to see Russia's aggression against Turkey. The Russians are bombing the hell out of Syria and are in bed with ISIS so as to provide a pretext for the destruction. Putin's Chechen's are heavily involved in ISIS as well as the invasion of the Ukraine. Russians control ISIS through Chechens, together with Israel and Turkey. Terrorism is textbook communist behavior. ISIS is there to provide a pretext for destruction, which compels intervention. Israel has wanted Syria destroyed for 2,500 years (Genesis 15:18-21. Isaiah 17. Jeremiah 49:23-27.) and is encouraging Russia to aid in grinding the nation of Syria to bits. Does not Israel's silence regarding Russia's military presence on their borders speak volumes? So much for our supposed greatest ally in the Middle East. Are you starting to see the pattern those dots trace out?